My Beatport DJ chart July 2015 is available! This month I’ve prepared a special classics Gabriel & Dresden Tribute CDMIX. It features many of their own productions, also some of their side projects like Motorcycle or Andain. Furthermore it features some unique remixes by DJ Kue, Agnelli & Nelson, Randy Boyer & Eric Tadla, Chapter XJ and Jorn van Deynhoven. Thanks to the permission by Dave Dresden I’m allowed to make this mix available for everyone! Enjoy! Tic Tac Trance #091 Replay available! 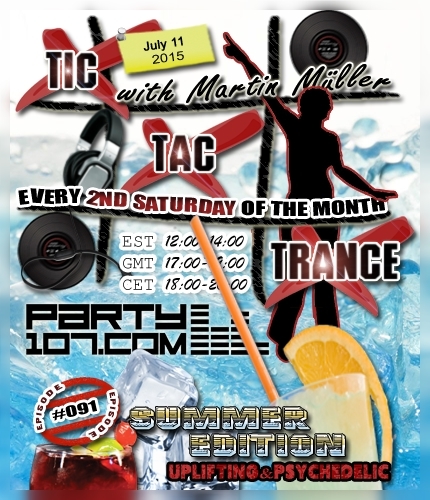 A special Summer Edition of Tic Tac Trance will air on July 11 2015 with episode #091 on Party107.com! You can expect for this show a 2 hours uplifting & psychedelic underground trance mix which will hopefully provide you also with a decent amount of summer vibes and vocal tunes! Make sure to tune in!